European honey bees have been present in Australia for about 190 years, but their distribution and abundance has increased dramatically over the last 80 years. The actual number of feral colonies is unknown but they are patchily distributed being least abundant, if not absent, from alpine areas and inland areas away from water. European honey bees visit the flowers of at least 200 Australian plant genera and interact with a wide diversity of native flower-visiting animals. Feral European honey bees may out compete native fauna for floral resources, may disrupt natural pollination processes and may displace endemic wildlife from tree hollows. However, there is insufficient research about interactions between European honey bees and Australian biota to fully describe their impacts. Managed hives of European honey bees form the basis of an industry that provides significant crop pollination services around Australia. 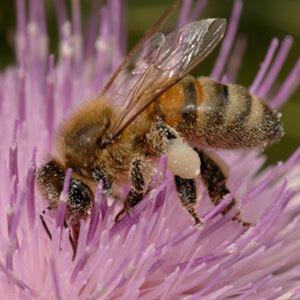 Pollination services and the production of honey and associated bee products were estimated by the House of Representatives Inquiry into the Future Development of the Australian Honey Bee Industry as between $4 and $6 billion in 2008.